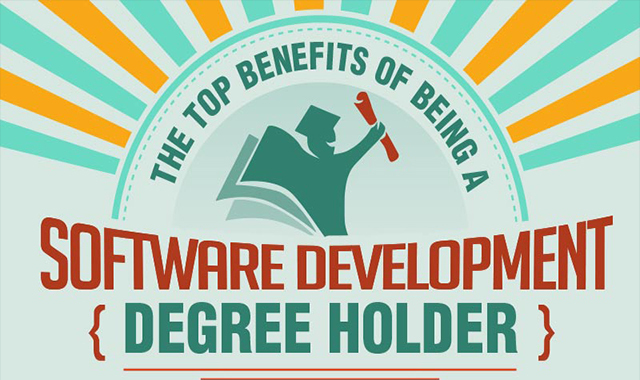 Top Benefits of Being a Software Development Degree Holder #infographic ~ Visualistan '+g+"
Software development is a thriving industry, with the job outlook slated to grow at a rate of 17% through 2024 Growing at a faster than average pace, software development is a dynamic and attractive arena for those seeking attractive salaries and unique opportunities.The barriers to entry into this industry are ever-changing. Understanding how to develop software is a learned skill, but being able to continually learn and adapt is a key attribute for software developers. Though anyone can learn how to code, there are a number of ways that a degree in software development can set individuals on a path to continued success in this growing industry.